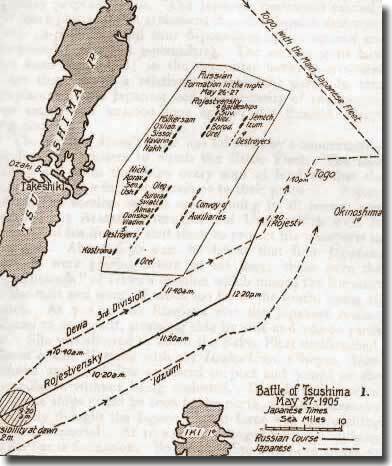 One of the most significant naval battles of the modern era took place this day, May 27th, in 1905, in the Straits of Tsushima between Japan and the southern tip of the Korean Peninsula. Russia's expansion in northeast Asia in previous years collided with Japanese Realpolitik. Tsar Nicholas II refused to negotiate with Japan, seeing them as an inferior nation lacking the stature to be treated as a peer to Russia. So when Japanese forces seized Port Arthur (modern ShenYung) in the summer of 1904, the Tsar dispatched his Baltic Fleet of 45 ships to "teach" the Japanese a lesson. Admiral Rozhestvensky and his fleet sailed for more than seven months, around Europe and Asia, approaching the Japanese mainland in late May 1905. At dawn on the 27th, Admiral Togo Heihachiro (aboard his flagship MIKASA) departed the port at Chinhae in Korea -- intercepting the Russian fleet just north of Okinoshima at 14:24 local time. By sunset (19:30 local time, about five hours later), more than 4,000 Russian sailors were dead and another 7,300 were Prisoners of War. Admiral Rozhestvensky's flagship OSLYBAYA was sunk, along with dozens of other Russian ships. Japanese losses were minimal: three (3) small boats and just 116 killed in action. Two lessons can be drawn from this encounter. First, the fact that the Russian fleet even made it to Japan is significant -- it was the largest, most complex endeavor by a fleet of that size, compounded by the increased logistics demand of modern ships. Second, the logistics success was trumped by the monumental failure of Russia's strategic intelligence. Rozhestvensky's total surrender the following morning near Takeshima (Liancourt Rocks) underscored the tactical and technological success of the nimble, cohesive Japanese forces that swarmed around the hapless and confused Russian fleet. The moral of this story is: never rest comfortably on your laurels -- especially when you're convinced that you have technical and numerical superiority. Tsushima represented a seismic shift in the balance of power in the world, and was the first time that a nation perceived by the "Concert of Europe" as a subject of colonization stood up and resoundingly defeated one of the great powers of the world.